The cost of fuel consistently ranks among the top three expenses for trucking fleets, putting fuel economy at the top of fleet managers’ minds. Increasing fuel efficiency and consequently reducing operating expenses is a major reason fleets turn to vehicle lightweighting, especially on components such as truck wheels. Trimming vehicle weight also increases payload capacity for fleets that run at or near the 80,000-pound total weight limit. “We have customers who are very weight sensitive,” said Mike Hasinec, vice president of maintenance at Penske Truck Leasing. Bulk carriers tend to rely on lightweighting the most, with fuel, metal and grain haulers topping the list. Lightweighting already is prevalent among bulk carriers and continues to spread to other sectors, according to the North American Council for Freight Efficiency. Finding places to remove excess weight has taken on renewed importance in recent years as mandatory and optional components are added to trucks. NACFE estimates that emissions regulations, fuel economy features and driver amenities have increased the typical Class 8 truck weight by 1,000 pounds, but fleets can remove 300 to 500 pounds per truck — if not more — by switching to lightweight wheels. When evaluating lightweighting opportunities, “there are certain components that we are cautious about” for safety reasons, such as the fifth wheel, which “has a lot of demand on it,” Hasinec said. “An aluminum fifth wheel might not hold up as well as steel,” and as a result, increase the risk of a partial lock and a dropped trailer. American Trucking Associations’ Technology & Maintenance Council publishes recommended practices for lightweighting. It notes that fleets can “reduce fuel consumption by specifying vehicle components with lower weights,” but they should consider each application and return on investment before making the switch. “Durability within an application is always a consideration; however, the magnitude of the concern depends on the component, vocation and operating environment,” said Robert Braswell, TMC’s executive director. Switching from steel to aluminum wheels is a popular way to reduce truck weight and manufacturers report a noticeable market shift in fleets and truck manufacturers requesting aluminum wheels instead of steel. The penetration rate for aluminum wheels in the U.S. market “is quite high,” said Joe Wolf, engineering manager for North America at Maxion Wheels. Manufacturers report their lightest aluminum wheels for Class 8 vehicles generally weigh about 40 pounds, which is up to 30 pounds less than standard steel wheels. However, modern steel wheels provide fleets more competitive, lighter options than in the past as manufacturers engage in “a continual march to lightweight,” said Maxion’s Wolf. The lightest Class 8 steel wheels have dropped in weight from about 80 pounds to 65 pounds over the past 30 years, in part because manufacturers have taken advantage of advancements in steel. The industry is moving to higher-strength grades of steel while simultaneously making that steel thinner, Wolf said. That means room for other truck add-ons or for extra freight capacity. In addition to being lighter than steel, aluminum wheels offer greater corrosion resistance, and aluminum wheels tend to be easier to keep shiny and new-looking, he said. Experts point to attractive truck appearance as among the known ways to recruit and retain quality drivers. However, the aesthetics value from aluminum wheels isn’t a prime consideration for every fleet. “It does look really nice, but trucks are having more wheel covers put on them anyway,” said Royal Jones, CEO of Mesilla Valley Transportation. Buying aluminum wheels and covering them with wheel covers eliminates any visual value, Jones said. 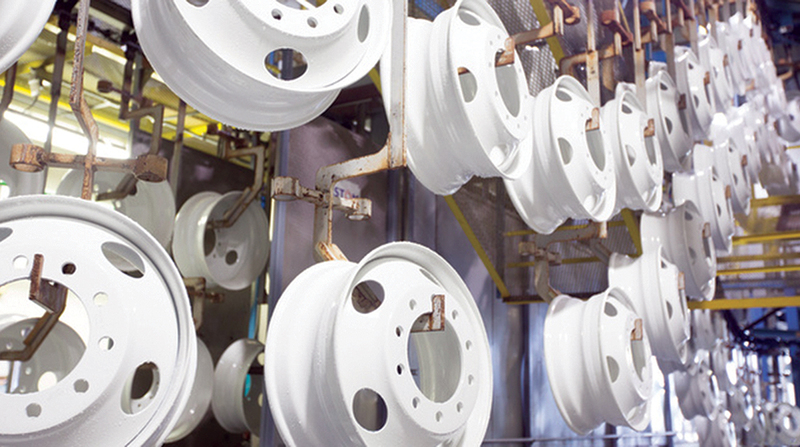 Fleets report numerous benefits from lightweight wheels, but one major factor prevents more of them from making the switch: the upfront cost, specifically for aluminum models. Long-term fuel savings and the money gained through extra shipping capacity with lightweight wheels outweighs the upfront expense for some fleets. But for others, switching to lightweight wheels might not reap significant financial benefits. “There’s a trade-off,” said Penske’s Hasinec. “Weight and aerodynamics really only start coming into play over a certain speed, and that speed needs to be maintained over time to realize benefits.” Therefore, lightweight wheels provide more fuel efficiency for longhaul trucking compared with regional trips. “It has to be the right application,” he said. Aluminum and steel wheel costs sometimes even out over time when factoring in the need to refinish steel wheels. Mesilla Valley doesn’t have an issue with refurbishing its steel wheels because “we send them in and they powder coat them and it makes them like brand-new again,” Jones said. But other fleets find refinishing to be too cumbersome or costly in the long run. “That maintenance piece is important,” said Orr, especially for carriers that operate in parts of North America that use a lot of road salt. Steel wheel corrosion is higher there. “Aluminum is not as much of a maintenance item,” she said. Some fleets are able to compensate for the upfront cost of lightweighting on the back end. And with aluminum wheels, “if you make that cost increase when you spec the tractor, you’re going to get the payback on the resale value,” Arconic’s Thomas said. Research from J.D. Power confirms that certain aluminum wheel models boost resale value. Wide-base aluminum wheels have not gained widespread market acceptance and “are therefore a liability,” he said. Lightweighting is one of the industry’s current “mega-trends,” said Arconic’s Thomas, but manufacturers also keep it in mind to improve efficiencies in emerging vehicle design. For example, truck manufacturers are introducing electric vehicles, and that battery power “only goes so far,” Thomas said. However, lightweighting could help ease the added weight burden of the battery packs, which can add thousands of pounds depending on the vehicle’s configuration and range.